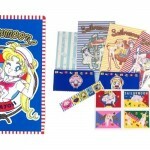 The 2nd year benefits for the Official Sailor Moon Fan Club have finally been shipped. I watched many other fans receive them over the past weeks and finally got mine. 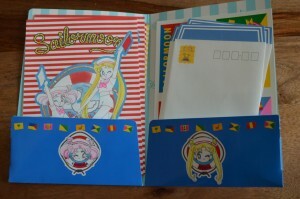 I was a bit disappointed with the first year Sailor Moon Fan Club as I got the membership, which included a card and a lip gloss package, but then I never ended up buying any of the fan club exclusive merchandise. 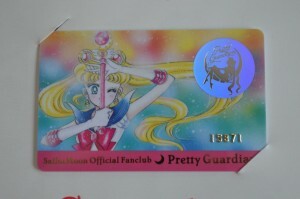 This second year’s membership includes yet another membership card, this time with Princess Serenity on it, as well as a Moon Stick necklace. 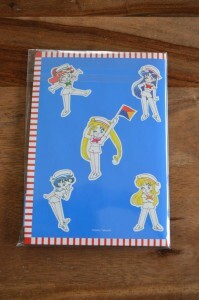 As a special incentive for returning members a stationary set is also included. This year’s fan club offerings already seem a bit better than last year’s. 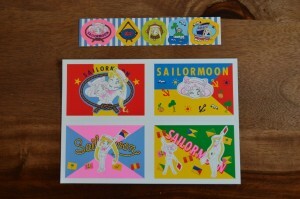 I’ve already pre-ordered the stamp set that will be released next year. 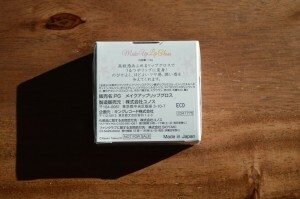 I wouldn’t call this a review as I’m really just going to itemize and briefly explain what was received! 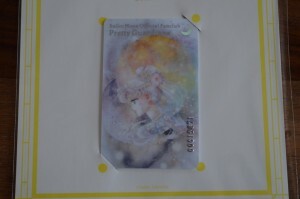 First we have the membership card itself which includes the membership number. The number is kept from the first year membership which is nice I guess if you like consistency! The art on the card is nice enough. I’m not sure what I would do with such a card. Keep it in my wallet and accidentally try to tap it when I make in store purchases? It’s a nice collectible I suppose. 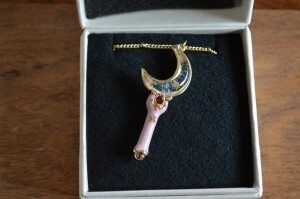 The Moon Stick necklace is nice enough. Again I’m not sure what I would do with it. 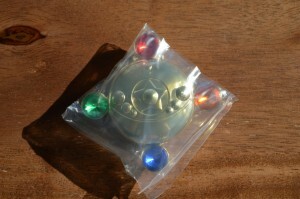 Some fans may choose to wear theirs and it’s nice enough to not look too much like a toy. Good for conventions or Sailor Moon meet ups. I’m not sure it’s really my style though so I’ll probably just keep it in its box. 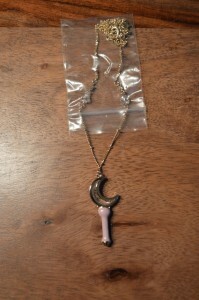 Back in the day I used to hang the crescent moon shaped necklace that came with the Sailor Luna cell phone in my car. Fans who don’t want to wear this as a necklace may find a similar use for this. 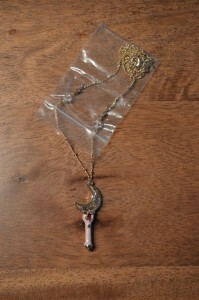 The back of the necklace is hollow which makes it look a bit cheap if you’re wearing it and it accidentally flips. 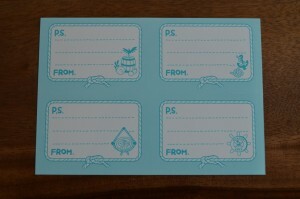 The stationary set is a nice incentive. 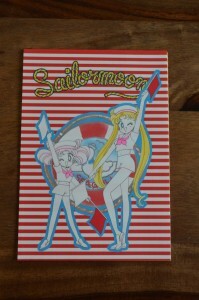 The cover and contents feature the Sailor Guardians in their civilian forms dressed as sailors. 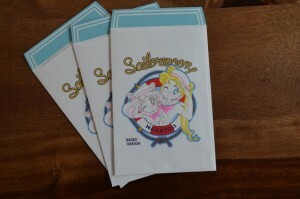 Real sailors for boats I mean, not as Sailor Guardians! 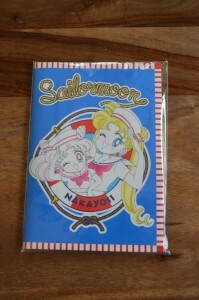 The cover shows Usagi and Chibiusa with the words “Nakayosi” (presumably intended to be Nakayoshi) on a life preserver ring. 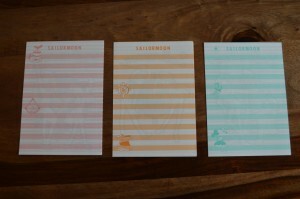 Inside we have stationary in the form of some sheets of paper of different colours. Three of each. 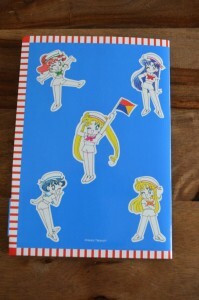 One shows Chibiusa and Usagi with a life preserver ring, another Minako and Rei with a wheel or helm and the last shows Ami and Makoto with an anchor. The flip side has room for writing on it. 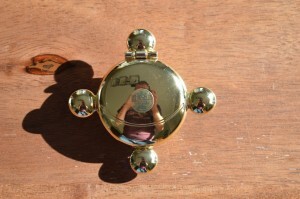 I imagine it would be real nice to write a letter on this but I could never get myself to. 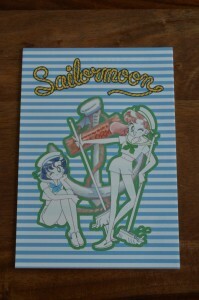 I have other Sailor Moon stationary I’ve gotten over the years and I’ve never tarnished them with actual ink! 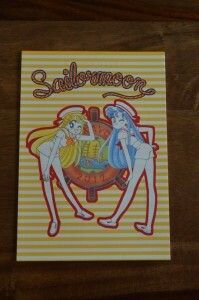 Also included are these sort of mini postcard type things. 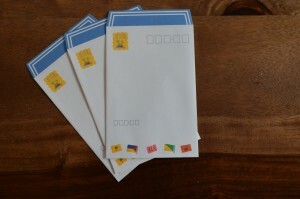 All of these can be put into these cute mini envelopes which I can’t imagine ever actually writing on, sealing and sending to someone. Am I just selfish? Well that’s about it. 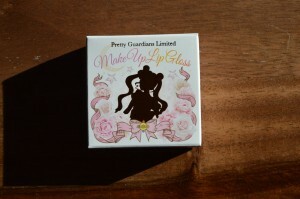 I had also never actually opened my first year lip gloss. Keep reading if you’d like some photos of that as well as other photos of these items. 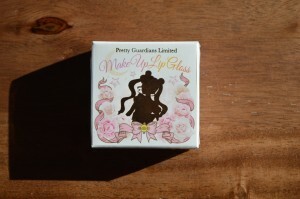 Lip gloss… what I am to do with this? 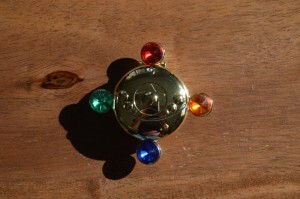 The first year incentive was lip gloss in a replica of Sailor Moon’s transformation broach. 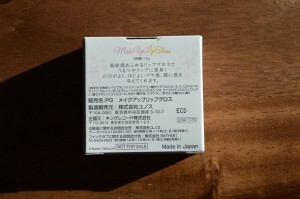 I couldn’t get myself to open the package since I intended to do a review not unlike this one and never really got around to it. Well I guess here it is! 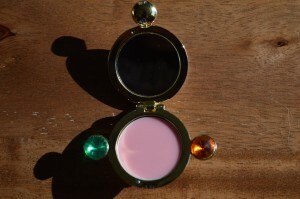 Would anyone really just use this as lip gloss? I didn’t actually put it on my lips. Not really my style! 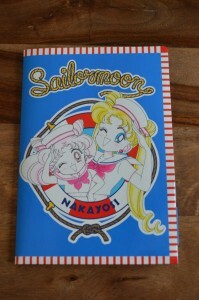 This entry was posted in Merchandise and tagged Official Sailor Moon Fan Club by Adam. Bookmark the permalink. I still can’t justify it for me. The necklace angers me since I’ve bought knockoffs on ebay for $1 or so that are incredibly detailed and close to the very expensive versions that aren’t hollow on one side. But as I’ve said before, I sincerely appreciate you sharing your stuff with us like this. 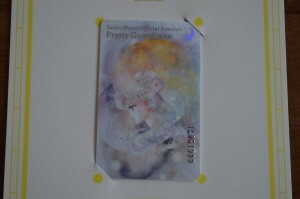 The Fan Club is a lot more worth it if you live in Japan. I was able to use it to get pre-order access to tickets for the Sailor Moon Classic Concert and the Musical – for the musical i ended up 4th row from the stage – not a bad benefit imo. 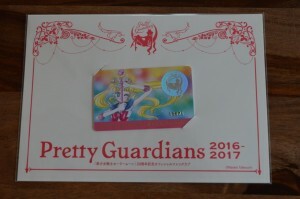 There is also a lot of stuff you can buy if you have a Japanese address eg the Japanese blu-rays with fan club benefits etc. 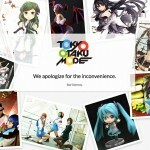 If I was living outside of Japan I wouldn’t be a member. 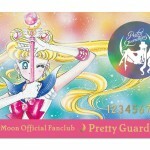 How much does a membership to Sailor Moon Fan Club cost?